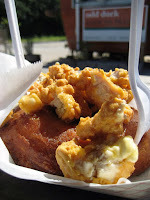 grubbus: Gourdoughs - The Doughnut, Overdone. Gourdoughs - The Doughnut, Overdone. This being Austin, Gourdough's Big Fat Doughnuts is housed in an airstream. It's big and it's shiny- and the visuals are just spot on. Clever little logo, hipster locale, homey menu board full of compellingly gluttonous options. And there's the rub: gluttony. In size, in goop, in grease, in sugar, these are larger than life - as over the top as you can push a doughnut. 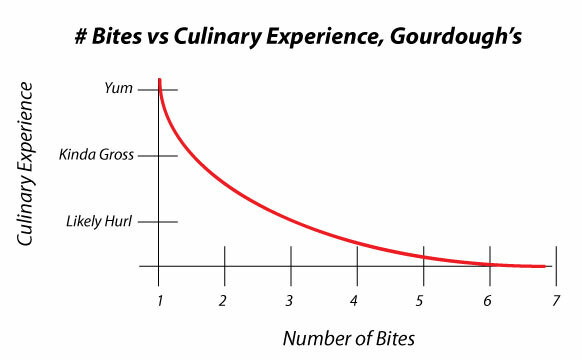 So while the first bite was heaven, by the fourth bite things were a bit much, and by the 6th I was pretty sure another bite was going to end badly. I tried two (admittedly, this was mistake - the trick with gourdough's is to order one and split it with 8 of your closest friends) - the Cinamon Sugar (Naughty and Nice) and the peach (Son of A Peach). My Gourdough's compatriat tried the fried chicken (Mother Clucker). The peach was definitely the worst of the bunch - it's a regular doughnut slathered in super-sweet peachy goo. Need not go into details. The cinamon sugar was a more solid choice. It's hard to go wrong with this combo, and it was fresh and pretty decent. The problem here was the level to which it was fried. I know, I know Doughnuts are supposed to be fried, but this one was TOO fried, almost as if the oil was too cold, and it just sort of soaked in it for a little while. Far too heavy for something that's supposed to be a treat. The best of the bunch, despite the extra-extra fried-ness was the fried chicken doughnut, which is to say, the doughnut covered in little nuggets of fresh fried chicken. The mix of the savory and sweet really works on this one - you almost need that salty kick to take the edge of the sugar. People swear by the maple bacon one, and I can almost see that working. Almost. In all, Gourdough's is kind of fun. It's a neat concept, and I'm sure, after a late night out in Austin, it might be a fun spot to go hang with the cool kids and split something decadent. But overall, it just kind of missed the mark. Sad, but true, Gourdough's proves the point: you can definitely have too much of a good thing. 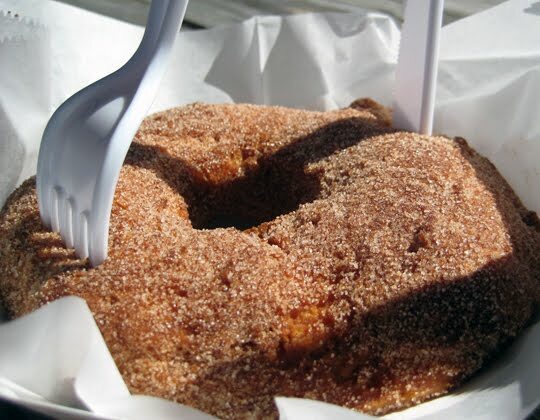 Incedentally, the perfect doughnut is made by Robinette's Apple Haus, just outside of Grand Rapids, MI. I've only taken the girls there once, and I made them share - I can't imagine eating an entire one. Too, too sweet, but a fun concept. Yes - portion size is definitely out of control. I was so hoping for transcendental doughnuts. May have been an expectations issue. How did your girls like it? 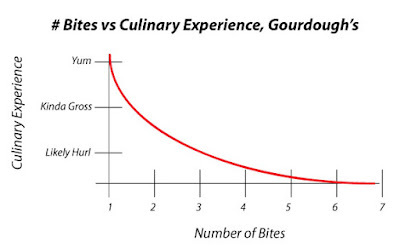 Completely agree with you on the diminishing enjoyment vs. number of bites. A while ago I got a groupon for four donuts for $7 so I tried all different ones the best I think they have is the Black Out. One of their downsides is it takes forever to get your order, did you find that? Yes, Dave! It did take forever. Not *forever* in the way it took me 9 months to reply to your comment, but forever as in twiddling our thumbs while the sun glared down and the minutes ticked by. I may actually head back to this spot - I think a visit later on, when things are really moving along may be a more fulfilling experience.